Cheap Skip Bins Sydney hire delivery to Liverpool, Parramatta, Bankstown, Blacktown, Ingleburn and Campbelltown. Great price, fast delivery and flexible options. 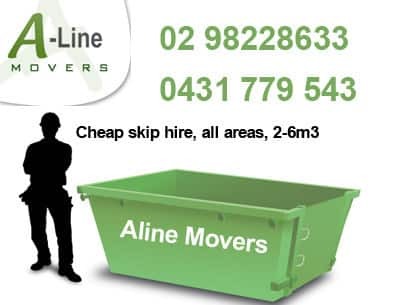 ALINE MOVERS provide skip bins for hire in areas surrounding Liverpool, Parramatta, Hurstville, Blacktown, Hoxton Park, Merrylands, Smithfield, skip bins in Ashfield, Strathfield and Sydney.Our popularity has grown due to being a cheap skip bin provider,efficient and friendly. Call us for a quote, we have special prices for builders, traders and regular customers. Get a quote now on 0298228633! after ringing around locally, A-line were the cheapest. great service from the very first phone call to delivery and pick up. extremely helpful and friendly. will definately reccomend. we cant thank them enough for their understanding and empathy leading to leaving the bin longer with no extra fees or charges. Phillip you are a star. One of the cheapest skip hire in Sydney we've found. Great service and very friendly. We have used their bins again and again through out our renovation. Excellent service, very reliable and honest. Prices was great compare to others. Definately will recommend to anyone. You won't find better.